In the box this week was a big, beautiful bunch of cherries. These are Ranier cherries, which (as I learned from the newsletter) were created when two types of dark red cherries were crossed. As you can see, the babies came out light yellow and pink, not red at all. It kind of makes me wonder if one of the parents demanded a paternity test. Regardless of whether these are legitimate or not, they sure are sweet and tasty. I decided to make a cherry cobbler out of them. So, I set out the cherries, the pitter, the flour, sugar and cinnamon, and a baking dish, and then I went to bed. In the morning, nothing was changed. I guess elves only help this kind of cobbler. The kind of cobbler I wanted was either a Betty, a Grunt, a Pandowdy, a Slump, a Buckle, or a Sonker. Of Course. What? I don't know. Wikipedia tells me that these are all types of cobblers. Apparently there are different names for this dish in different parts of the United States. And according to Wikipedia, only the deep south allows for serving it with a scoop or two of ice cream. I just wanted to make life easy by not having to roll out a pie crust, and so I made a cobbler. Mine had the very specific name: Cherry Cobbler. It may have been a Cherry Slump, for all I know, actually. Hey, did you wonder where the name cobbler comes from? I assumed it was because you just get to cobble together a bunch of stuff and have it come out awesome-tasting. It is actually because the dish resembles cobbled streets when it is done. Who woulda thunk? You know what else Wikipedia told me? There is also a drink called a Cobbler... made with wine, citrus juice, and sugar. Hmm.... I think I should have skipped right to that kind of cobbler in the first place. Ahem. I think I may have digressed once or twice. Back to the ingredients the elves didn't use. This can be made with any type of cherry. 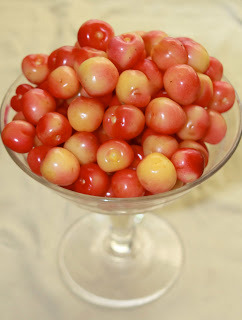 I used the Ranier cherries I got in my CSA box, and I added a few Bing Cherries, for their dark red color. I thought it looked nicer with the glaze turned deep red from their juices. Remove the pits from 6 cups of cherries. If you don't have a cherry pitter, get one. If you don't want to get a cherry pitter, made apple cobbler. Just kidding. You can use a paper clip or a knife. It just takes a while and stains your fingers temporarily. Combine the pitted cherries, 1 1/4 cups sugar, 1/4 cup water, and 4 teaspoons of cornstarch in a saucepan. Cook, stirring until bubbling and thickened, a few minutes. Pour into an 8x8 baking pan. Meanwhile stir together 1cup flour, 1/4 cup sugar, 2 tablespoons brown sugar, 1/2 teaspoon cinnamon, and 1 teaspoon baking powder. Cut in 3 tablespoons of cold butter, until it is all crumbly. Lightly beat an egg, add 3 tablespoons milk, and add to the flour/sugar mixture, stirring just until it is all combined. Drop the topping by teaspoonfuls onto the cherry mixture. Pop it all in the oven for 25 minutes, or until it is all brown and bubbly. Serve it warm, with vanilla ice cream (if you live in the deep south, that is).